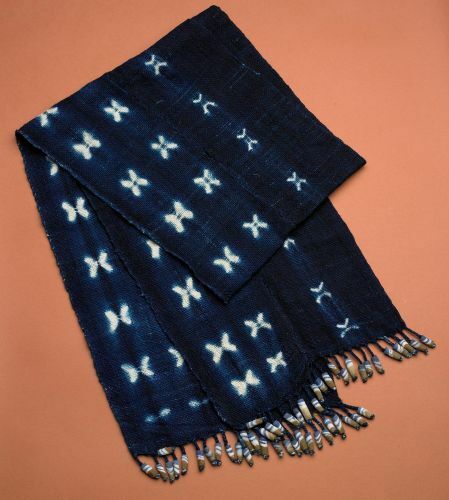 The beautiful, deep blue color of indigo is one of the richest colors found in indigenous fabrics around the world. Traditionally, the men do the weaving of the un-dyed cloth, using thread that is hand spun from locally grown cotton by ladies using hand made spindles. The men weave long strips of cotton cloth, which are sewn together to create the desired width. Lady artists decorate the fabric by tightly stitching the un-dyed cloth using various patterns. In a process similar to tie-dye, the stitching is removed after the dye process and the resulting white patterns remain. Indigo material should be washed separately in cold water to avoid staining other fabrics, and hand washing or dry cleaning is recommended.